Happy weekend!! 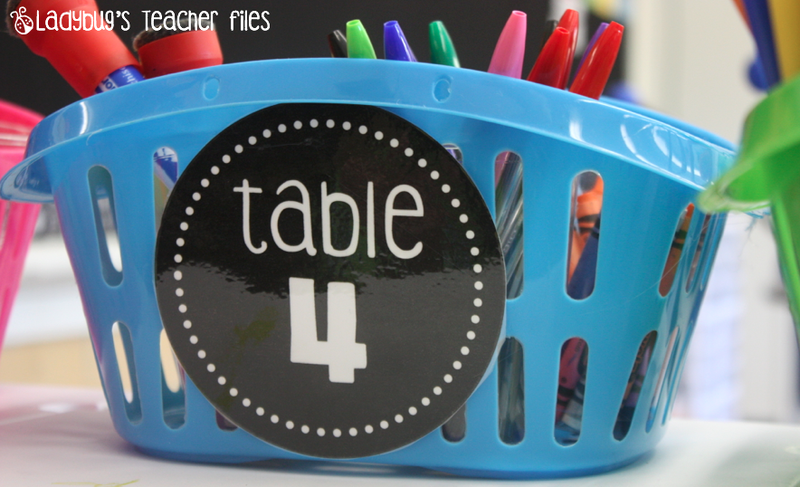 Today, I wanted to share a bit about how I organize my students’ tables and materials, in hopes that you may be able to use one of the signs or storage ideas. It’s very easy to change seats (no more moving furniture!). We don’t have any more hidden messes inside the desks (nothing worse than finding an old milk in the recesses of a desk, believe me!). Everyone has their own place to sit, but groups can be fluid and change easily for collaboration in different subjects/lessons. Though I love my tables, I will be honest with you, my dear readers. It really has taken some time to evolve into an ideal system, storage-wise. BUT, I think I finally have it just the way I like it and, most importantly, in a way that keeps my students organized and ready to go at all times! I love these drawers!! They hold a great amount and make everything look all neat and tidy when packed up at the end of the day! This is the newest addition to our system. 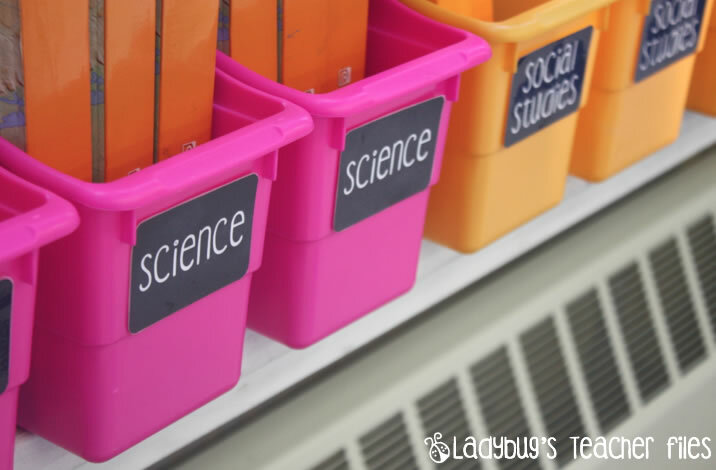 In the past, I’ve always kept my community supplies in baskets, on a shelf for students to grab and use. This month, I decided to tweak my supply system a bit and add everything we might need during the day and label it by table number (I think I am number obsessed this year!). everything we might need during a lesson…and anything that will eliminate time wasted on passing out materials! Each group has a table manager in charge of keep the materials organized and placed out on the tables. At the end of the day, the baskets are returned to the shelves, so the tables are clear and ready to clean. What about those students with lots of supplies from home? I have a couple who have pencils boxes of all those awesome pens, markers, and fun little items. I definitely get this (loving a variety of supplies myself) and don’t mind if they keep these out on the tables overnight, as long as they are in a pencil box. I don’t have a current picture of my chair pockets yet…it was a hit-the-ground-running kind of start to the school year and I still haven’t attached them. My goal is to get them up this week, so my students can have their current read right at their fingertips. I loooooove all of your stuff, but I'm really eyeing those labels you used to label your drawers! Your stuff is awesome! We're having a 200 follower giveaway, we'd love it if you stopped by and entered! We have lots of pretty fantastic prizes! This is my first year with tables and I am such a happier teacher 🙂 My room always looks clean, even when it's not, because the tables give it such a zen-like-look (yippee!). I am still tweaking and love this post because it's given me even more ideas, many thanks! I have had desks and tables. I have tables now, and I despise them. They are the trapezoid shaped ones. There is just so much of the table that is unusable, not like the rectangle tables which look more useful. I wish I could have the desks back. The interesting part is that my kids have talked about how they prefer desks. They want a more defined space to work. Thanks for sharing your tips! Maybe I will grow to love tables like you! whenever I read your posts I feel calm and happy. I bet your students feel the same way in your ultimately organized room!!!!! This is making me want tables. I never thought I'd say that, but I think I do. My principal will love me for this 🙂 (I'm actually serious.) Everything can be organized with tables and you've proven that to me. I just love reading about your methods for organizing everything. You are my organizing idol! We have desks and I wish I had tables. I hate having to spend time checking that they are tidy and then having to make sure they get tidied. I also use baskets on my desk, except they are soft sided draws that get put away at the end of each day. I like them because even if the drawers are in a mess, you can't see that when they are put away and because they are drawers they take up minimal space and do not get knocked over. WOW, I LOVE how organised you are! I am a temporary teacher (year long contract) and I am working around the class teacher's stuff which makes it quite difficult. You have inspired me to get table baskets for pencils etc… as my kiddies have to get up and walk around the room to get scissors, glue etc… at the moment and it just isn't working ;P Thanks for sharing!! I love the way you've done this. I'm using your awesome numbered box labels in the white plastic drawers for the first time this year, and I love them. My kids are only using them for Reading and Writing Wkshps., and it's been great to be able to grab a student's reading and writing notebook without having to dig through a million bits of nastiness! Everything else is in their desks, and I try to keep this under control with desk partners and Friday afternoon cleaning. I personally prefer tables, especially having been a primary teacher forever (now 5th), but I will say that the kids love the desks. I think it's the age–having their own lockers and desks is a right of passage and gives them a feeling of privacy. I'm aiming for tables again someday! Question–how do you deal with the issue of, um, cleanliness? I went back to community supplies in bins on a shelf last year after going with personal supplies, and the amount of illness in my class increased like CRAZY, including me developing pneumonia. I am a maniac about hand washing and I have tissues and hand sanitizer plastered everywhere this year–I wasn't ready to give up on it yet! 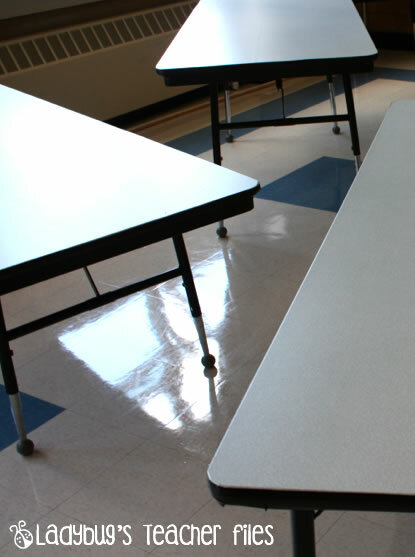 As for cleanliness…I clean the tables every single day with Clorox wipes. This has really helped keep the germ factor down, so I am crazy-diligent about it! SO I was thinking: put in some pencils for each group basket, and the table manager/supplies manager will have to make sure they are always there before the class leaves. AH-HA! Wonderful. I'll start trying it next week. Thanks for the spark! I've had the luck of always having tables and I love them. I agree at first it was hard getting a handel on the storage piece part, but once I got it, it was the best thing to happen to my room. I totally get the legs and open desk comment. It just looks cluttered and not pretty. 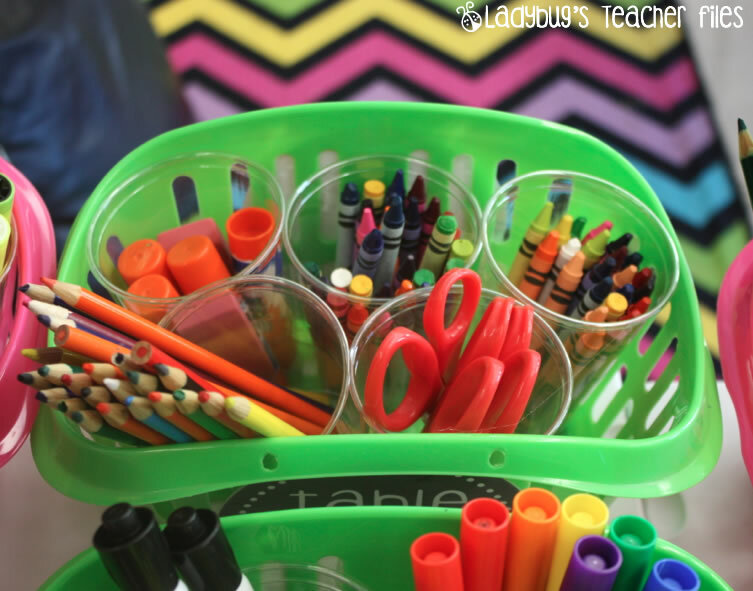 I finally switched to table baskets this year instead of pencil boxes. BEST.CHANGE.EVER! I so wish I could just do tables, I have my kids desks grouped and coud certainly turn them around so they wouldn't be able to put things in them, but the constant shifting of the desks and the continuous sound the echos from everything they do with them drives me batty! I am so envious of your beautiful, silent, clean tables! I have desks. I like them because my kids can be separate from each other. My class talks SO SO MUCH! They are out of control! I think for them, tables would be a disaster! But I live the cleanliness of tables. I wish I could do tables. Maybe another year. As usual, your ideas are awesome! I tried the community basks on the desks for supplies, but because my kids have the desks that open on top (the top swings open and they can see inside), the baskets were constantly tipping over, spewing supplies all over the floor. While the kids were patient with it – what fifth grader doesn't love sprawling himself on the floor to "rescue" his lost supplies – it was driving me nuts. I finally went back to each student keep his/her own supplies inside the desk and if a special item is needed, I have a supply manager to pass it out. If I had tables, I would definitely try the supply baskets again. I love your table group numbers. I numbered mine last year, but this year I decided to try something different: to incorporate geography and history (and to fit my travel-theme classroom) I named each group after continents 🙂 But if I ever go back to groups, I am going to use your adorable number labels! I love these ideas! I am a huge supporter of tables. I start my new teaching job on Monday (tomorrow!) and I haven't even seen my classroom yet! I know, that's crazy! Anyway, I want to incorporate your drawers system at some point, since I have two groups of students coming in and out of the classroom, it would keep their writer's notebooks and reading materials, not to mention social studies materials, conveniently located. No more, "I need to go back to get my writer's notebook in my other class, Miss J", instead its all right there. Thanks for this wonderful post! 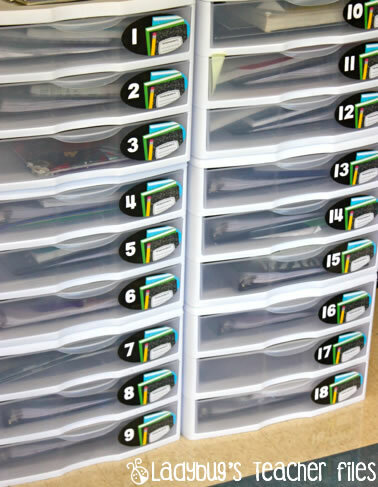 Another great idea Kirstin, I have table leaders that manage materials which includes a labeled folder with assignments or assessments at each table. They still had to get up to get my highlighters and glue to highlight important words they see in word problems . I love your newest idea! I love baskets too! Your ideas have made my classroom very pleasing to the eye. We are evaluated using COMPASS and the Danielson rubric. Student management plays an important role in my evaluation process. Thanks again. I absolutely love how organized you are. It makes me feel normal! And I always love your labels! 🙂 I hope you and your pups are well! I wish I were this organized!!! 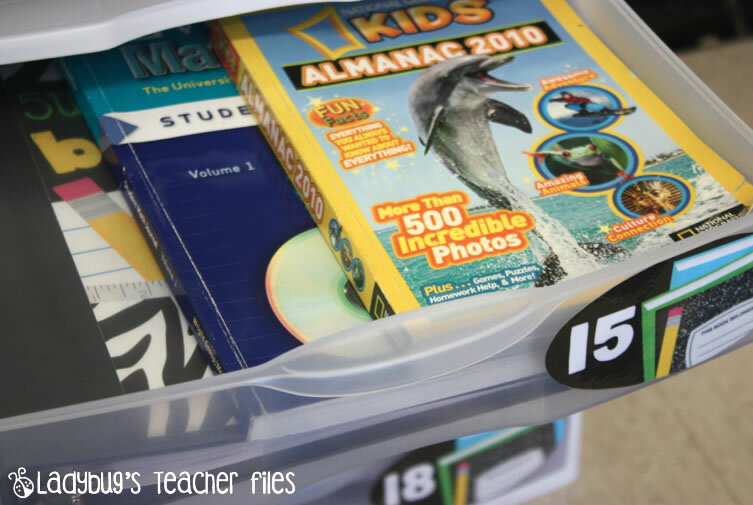 I'm definitely going to be incorporating more of your organizational techniques for next school year. I've learned so much from your blog. You are such an inspiration. I don't have access to tables, but I group my kids' desks into tables. They share a tub of supplies that is kept on their table. This was this single biggest IMPROVEMENT I have made this year!!! No one owns anything so there is no problem sharing. As for the kids who brought stuff, I asked them at the door if it was a class donation. If so, we kept it. If not, I turned them around and told them to take it home and to keep it in a place where they do their homework. No more running in and out of the classroom to get their treasured markers out of their backpacks! No more overstuffed pencil boxes to deal with! No more hoarding cut up erasers in their desks!!! So much less distraction! Wow, I wish my classroom was as organized as yours. I'm so inspired to jazz up my organization system now! (Your labels are really awesome too.) I'd agree that tables and group supplies can really aid instruction, but I can't seem to make it work with my middle school classes of 28 students. 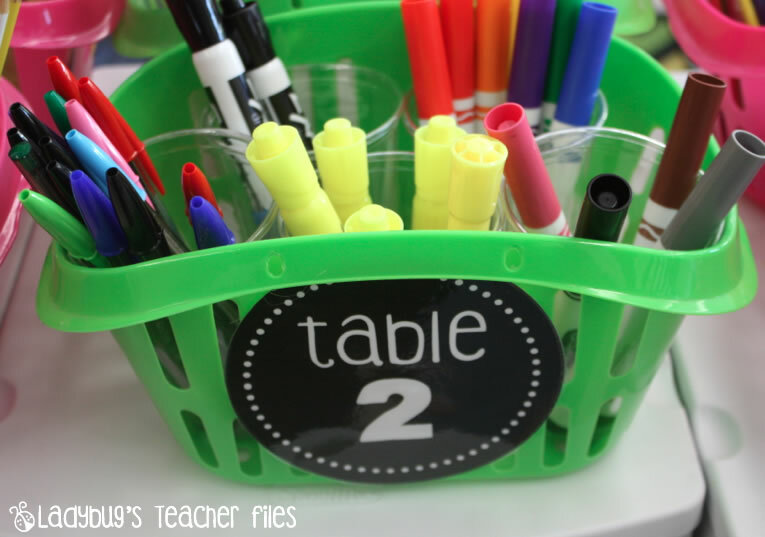 My kids change classes every 40 minutes and it seems like table bins with supplies disappear within a few days. Any suggestions for how I can keep the supplies in my classroom? I've been tossing around the idea of tables but it makes me nervous. Our current budget concerns don't allow for the purchase so I'd be buying them myself. The talking and germ factors are also something to think about. I've seen an organizational idea on pinterest for tables. The teacher got a small bookshelf with two shelves for each table. That is where the kids would keep their books, binders, and folders. I think this is what I'd do if I ever take the plunge. What do you do during state testing if you can't spread out desks?